It appeared that from day one, executives at Chevrolet realized that the Chevrolet Camaro, including the Camaro SS, would shake the automobile industry to the core. Chevrolet’s answer to the Ford Mustang, the Camaro was announced at a special live press conference at the Statler-Hilton Hotel in Detroit on June 28, 1966. It was the first time in history that an event like this was connected to 14 cities in real time via telephone line. The car was actually introduced during the 1967 model year on a new rear-wheel drive GM F-body platform and was available as a two-door coupe or convertible with 2+2 seating. The first generation models included a Super Sport and Rally Sport editions. The second generation of the model was introduced in February 1970 and was produced through the 1981 model year. Road & Track Magazine selected the 1971 SS350 as one of the 10 best cars in the world in its August 1971 edition. The SS package was dropped in 1972, but reinstated in 1996. The reintroduction of the SS occurred in the middle of the fourth generation of the car (1993-2002). However, it was offered in a limited quantity and included a 330-horsepower LT4 small block engine originally used on the Corvette. The 1997 model featured a refreshed interior and the 1998 model included an aluminum block LS1 5.7-liter engine, which was used on the Corvette C5. It was the first all-aluminum engine to drive a Camaro since 1969 when one was used to power the ZL-1 and it generated 325-horsepower. From 1998 through 2002, the SS was fitted with slightly improved exhaust and intake systems, bigger wheels and tires, and an improved suspension, an arc-shaped rear wing for downforce, and a different gearing ratio for faster acceleration. In the fifth generation of the model (2010-2015) the SS was equipped with a 6.2-liter (376 cu in) LS3 V8 that offered 426-horsepower (318 kW) and was mated to a 6-speed manual transmission. An L99 V8 engine that delivers 400-horsepower (300 kW) powered the automatic SS. The Camaro SS is one of the most powerful Camaros offered. It should not be surprising that drivers of the 2010-2015 Camaro SS would want to boost performance if possible. That’s where the AIRAID 251-714 Jr. Kit comes in. The kit is designed to improve the restrictive elements of the factory intake system, the intake tube, and the paper filter of the Camaro SS, helping boost horsepower and acceleration. The Jr. 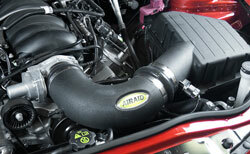 Kit includes a roto-molded, modular polyethylene intake tube, four stainless steel clamps, one coupler, and an AIRAID 851-427 direct-fit replacement air filter. The tube is engineered to straighten and smooth out the pathway of the airflow to the engine. The washable and reusable air filter features a dry synthetic media called SYNTHAMAX that includes an inner and outer layer of durable wire mesh that prevents the filter construction from deforming or collapsing under high airflow. The inner filter media has two independent layers of synthetic materials. The outer layer of synthetic needle felt polyester material captures and holds contaminants and the inner layer of wet-laid/chemical bonded rayon and polyester material catches any remaining contaminants. The air filter can be used for 30,000 to 50,000 miles before servicing is required. 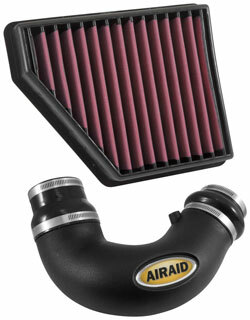 AIRAID also offers the 790-558 air filter cleaning kit that is specially formulated to cleanse and recharge the filter so that it can be used over and over again for the life of the car. The AIRAID 251-714 Jr. Kit can be installed using common hand tools in about 90 minutes. It is backed with a No-Hassle Lifetime Warranty.